I’ve been browsing through some of the great Canadian local history databases lately. For general Canadian history, Canadiana.org has some terrific content. There are a couple of free databases there but the most inclusive one is Early Canadiana Online which requires a subscription. For western Canada, Peel’s Prairie Provinces is free and hosted by the University of Alberta. 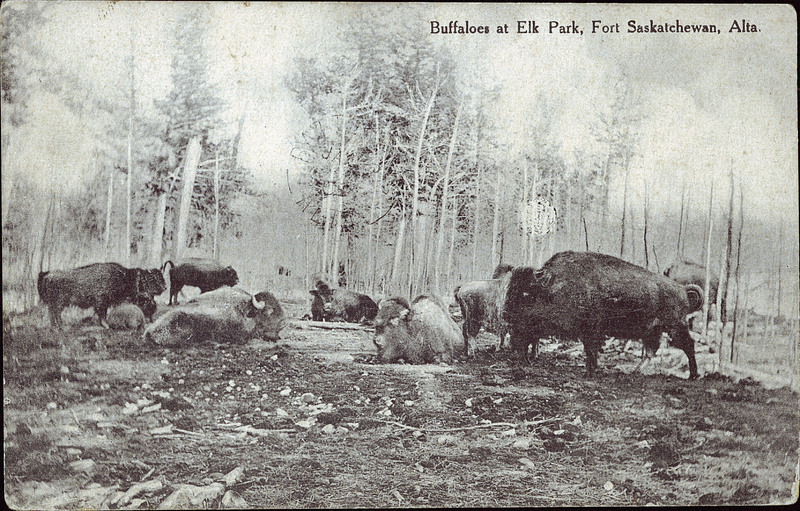 Buffaloes at Elk Park, Fort Saskatchewan, Alta. [Fort Saskatchewan: ca. 1910]. Address: Fragmew, Cheriton Rd., TolReston, Kent, England. I was excited to see this and posted it to the Goddard Association of Europe’s Facebook page. My Goddards come from Kent so I was wondering whether this might be an ancestor. Regardless, I figured it would be interesting to someone. While the sites I mentioned above are not specifically genealogical, this demonstrates the importance of having a peek at other resources to flesh out local history of our ancestors and maybe come across something special!